German police deployed water cannons against protesters at a rally against sexual assaults committed by suspected asylum seekers on New Year's Eve. 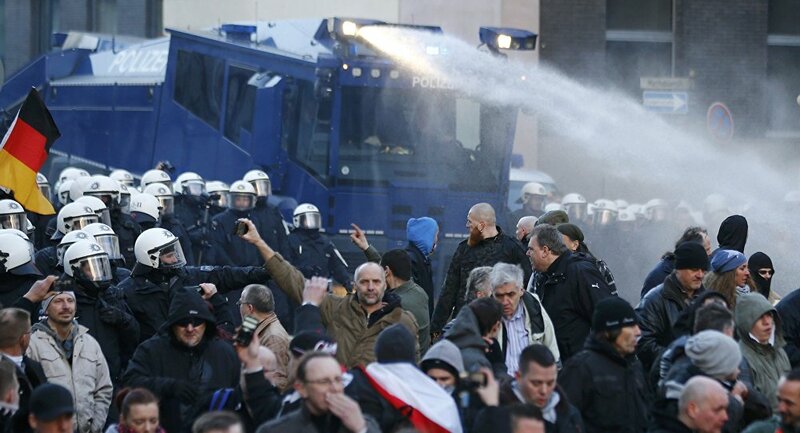 German police used water cannons and pepper spray to disperse a right-wing rally in Cologne against assaults committed by refugees against women on New Year's Eve in the city of Cologne, Reuters reported. Two people were injured after a clash between protesters and police, and several were arrested. The roughly 3,000 chanted slogans such as "Merkel must go," and acted violently against police, an eyewitness told Reuters. "Rapefugees not welcome," one banner reportedly said. According to police, 3,000 people attended a rally while 1,700 police officers were in the streets, considerably larger than the number of police present when 120 women were robbed and sexually assaulted, Reuters reported. Left-wing women's rights activists earlier protested the assaults in Cologne. "No means no. Keep away from our bodies," one sign read, according to Reuters. Cologne police said on Tuesday that they had received around 90 statements from women sexually assaulted on New Year's Eve. Of 32 suspects identified by police so far, 22 were seeking asylum in Germany, Reuters reported.